Thank you for joining me as we count down to the MFT release. We are just two short days away from the big day! All the new Stamps and Die-namics will be available on Tuesday, February 6 at 9:00 pm EST. Be sure to check out the MFT Blog to see all the new items being revealed today. Don't forget to leave a comment on the MFT Blog countdown posts, YOU could win one of the five $75.00 gift vouchers. As you can see, I am still having fun with Alcohol Inks. I went for a rustic, earthy color combination with this one. Lots of brown, orange, and coral. 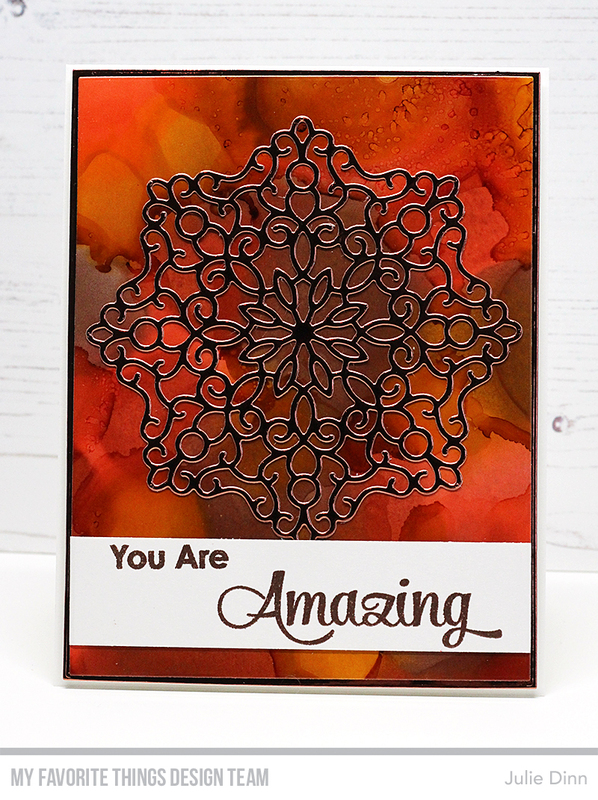 I love the look of the gorgeous Magical Mandala in Copper Shine card stock, against the ink background. The sentiment is from one of my favourite older stamp sets, Simply Fabulous Sayings. Your elegant card with the amazing red base and copper mandala makes a wonderful Valentine! This card is seriously amazing!Totally eye-catching! Beautiful card! Love all of the colors! GORGEOUS! I love this new mandalla and the alcohol ink background is amazing!